The discipline of Endurance is undergoing a full review of its rules. One of the key innovations introduced in new rules, which will come in force on 1 January 2009, is the emphasis put on the education of all officials involved in the discipline be they judges, technical delegates, and veterinarians. A significant contribution towards this new development will be brought by the agreement which was recently concluded between the FEI and Hydra Properties of Abu Dhabi (UAE). Thanks to this support, which spans over two years – 2008 and 2009 – amounts to DHS 500,000 (CHF 134,000), a worldwide educational programme will be set up. Courses will be organized and the documents used in these courses will be thoroughly reviewed and updated to include a handbook on the discipline, CDs and DVDs. Hydra Properties’ sponsorship is the very first of its kind and is quite unique in the sports world in general in that it is solely intended for use in education. It is key in that it comes at a crucial moment of the development of the sport and, if well used, will contribute towards setting the foundation for proper growth. Hydra Properties, in conjunction with the Abu Dhabi Sports Council, has been a strong supporter of FEI competitions within the UAE. Hydra Properties is an organisation which is behind some of the most prestigious residential and business developments in the UAE. The FEI is proud of its association with Hydra Properties and sees it as a fantastic opportunity but also as a challenge to develop the professional level of Endurance. With 46,000 members, the Arabian Horse Association (AHA) provides many opportunities for Arabian horse enthusiast to tap into the Arabian horse lifestyle. The AHA is a full service breed association and registry for owners of Arabian, half-Arabian, and Anglo-Arabian horses. For more information about the AHA, visit www.arabianhorses.org. The Equestrian Partners Program is a growing coalition of organizations from across the country that are committed to helping ELCR fulfill its mission of conserving land and access for all equines. Despite their diverse interests and activities, our Partner members recognize that with land in the U.S. being developed at the rate of 250 acres/hour, the future of equestrian life as we know it is endangered. If your organization would like to join our national efforts to save land for horses, visit www.elcr.org, or call ELCR at 859-455-8383 for more information. A recall of certain refrigerators manufactured by Dometic includes units used in some horse trailers, according to a manufacturer's notice. The defective refrigerator units were manufactured between April 1997 and May 2003 and are designed for use in recreational vehicles. The refrigerators pose a safety hazard, due to the possibility that a fatigue crack can develop in the boiler tube. This can allow the release of pressurized coolant solution. If this solution is exposed to an ignition source, it can result in fire under certain circumstances. To determine whether your refrigerator is included in this recall, find the model and serial number by opening the unit's door and looking for the sticker attached to the side wall of the interior. The affected units require immediate service. Continued use could pose a safety hazard. Call 888/446-5157, or go to DometicUSA.com to confirm if your refrigerator is included in the recall and receive additional instructions. Pushing the envelope of equine athletic prowess, 37-year-old half-Arabian Elmer Bandit is gearing up to start yet another competitive trail ride season. In 2007 Elmer's certified lifetime competitive miles stood at 20,240, nearing the national record of Saddlebred Wing Tempo's 20,710 miles. The World Endurance Championship Early Application deadline is May 1st, 2008. 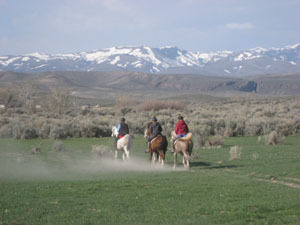 While Applications and Horse Nominations can be made until June 15, 2008, the fees are higher for those applications postmarked, faxed or hand delivered after May 1st, 2008. The application must be accompanied by the appropriate fee. Procedures and applications can be found on the USEF website, www.usef.org. For further information regarding application or selection for the World Endurance Championships, contact Vonita Bowers at vbowers@usef.org or (859) 825-6001. I. APPLICATION - Athletes wishing to be considered for the 2008 World Championship Endurance Team must complete an Application Form (see attachment A) and return it with the appropriate application fee to the USEF, Attention: Vonita Bowers, Endurance Director, 4047 Iron Works Parkway, Lexington, KY 40511. Applications and fees postmarked, hand delivered or faxed on or prior to May 1, 2008 will be charged an Application Fee of $50 PER APPLICATION. Applications and fees postmarked, hand delivered, or faxed after May 1, 2008 and received on or before June 15, 2008 will be charged an application fee of $300 PER APPLICATION. HOWEVER, NO APPLICATIONS SHALL BE ACCEPTED UNLESS RECEIVED ON OR BEFORE June 15, 2008. NO APPLICATIONS SHALL BE ACCEPTED IF THE APPROPRIATE FEE IS RECEIVED AFTER June 15, 2008. II. HORSE NOMINATIONS - Athletes wishing to be considered for the 2008 World Championship Endurance Team must complete a Nomination Form (see Attachment A) for each horse that the athlete wishes to nominate and return it with a nomination fee of $50 PER HORSE NOMINATION to: USEF, Attention: Vonita Bowers, Endurance Director, 4047 Iron Works Parkway, Lexington, KY 40511. Nominations and fees postmarked, hand delivered or faxed on or prior to May 1, 2008 will be charged a Nomination Fee of $50 PER HORSE NOMINATION. Nominations and fees postmarked, hand delivered, or faxed after May 1, 2008 and received on or before June 15, 2008 will be charged a Nomination Fee of $300 PER HORSE NOMINATION. HOWEVER, NO NOMINATIONS SHALL BE ACCEPTED UNLESS RECEIVED ON OR BEFORE June 15, 2008. NO NOMINATIONS SHALL BE ACCEPTED IF THE APPROPRIATE FEE IS RECEIVED AFTER June 15, 2008.